Rose Hutchinson is the oldest living Goshen College Alum. She was born in 1913 and graduated with the Class of 1935. 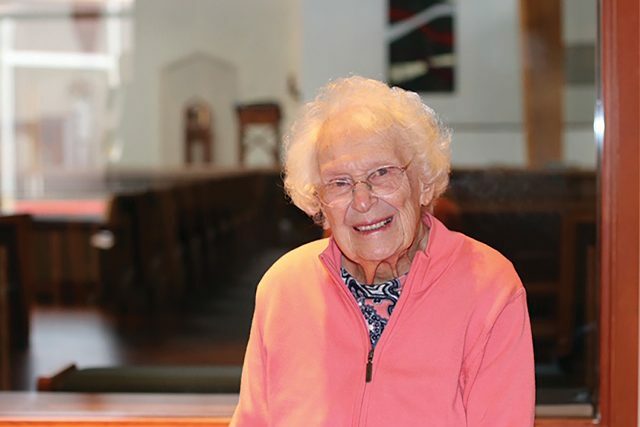 At the age of 105, she is still an active member of her church and community. What led you to decide to attend Goshen? I wanted to go to college and that was about the cheapest way I could go. My dad shoveled out the money at the time and I told him I would pay him back. Did you end up doing that? Yes! I paid him back. He was happy with that. I can imagine. Ten years before you enrolled at Goshen, colleges around the world began welcoming females to enroll, but it wasn’t exactly a common thing. Well, all my friends were going to college, and I wanted to be just as smart as they were. What did you end up doing after graduating from college? When I got out of college, that was during the Depression time. I got a job at the Snuggle Rug Company. I started out as secretary, and then I became their postmaster. Then I wound up in the public relations department. I also was a secretary to the president at the Indianapolis Drop Forge company. They make bolts and nuts. Did it help to have earned a mathematics degree at Goshen? Yeah, it came in handy. I don’t know why I chose math, but I had a friend that said, “If you want to get a job teaching, you’ll have to take math.” I took her word for it. Your college career started in 1931, and that was the first year that Goshen College ever welcomed non-Mennonite enrollments, correct? Yeah, they used to not let in anybody unless you were Mennonite. I was very fortunate then because I sure made a lot of nice friends. What was the atmosphere like when you attended Goshen in the 1930s? It was small at the time. There were only three main buildings. The main building had most of the classrooms in it, and then there was the science building. And that was it. Everybody was friendly and helpful. I just enjoyed all of them. When I spoke with your daughter Hilary, she told me that you are still an active member in your church. As a religious person, how was your faith impacted by your time at Goshen? I think that it deepened my faith with God. It helped me on my spiritual journey very much because they (classmates and faculty) were very spiritually-minded people, and they all seemed to be so helpful. “Culture for Service,” it’s true. This is a fact. So do you identify as Mennonite? My husband (Tom) was Catholic, and I took instructions for the Catholic church. Well…I didn’t really take instructions. The priest told me to just have Tom teach me, and I said, “Oh yeah, that’s going to be good.” But I’ve enjoyed my religion. That’s really been my stronghold. What are some of the memories that you have made at GC that still stick with you today? I was a good friend of Roy and Fern Umble. I spent a lot of time with them. I went to high school with Roy Umble. Roy Umble was one of my first boyfriends. Speaking of boyfriends, I am curious as to how you met your husband. This was during the Depression time, and he was painting fences on the 5th Street school playground, around there. I was playing tennis over in their single city court, and he came over wanting to know if I would stay and play with him after I finished the last game with whoever I was playing with. And so I did, and that’s the way we met. Did you play tennis at Goshen College? Nearly a decade after you graduated from a pacifist school, like Goshen College, World War II broke out. How did the pacifist ways of Mennonite culture at Goshen College impact your understanding and the ability to cope with such an international conflict? I’ve always been a pacifist at heart, and I think we should negotiate. I just tried to spread the news that that’s not the way to go, but I was busy raising children around that time. Right now, you live in Oregon. What caused you to make that move across the country? I’ve lived an adventurous life, that’s for sure! It was pretty traumatic, because I came from the lowlands to the mountains. It took me some getting used to, all these snow-covered mountains out here. You have eight kids, but what is the age range from oldest to youngest? Nineteen years. I kept them along on the right way. Nobody got in jail or anything, and they all turned out pretty good if I do say so myself. They must have kept you busy. I enjoyed raising my children and they all turned out pretty good. They are community-minded people, so I keep pretty busy. I always have someone to turn to, so I don’t worry about too much. When’s the last time that you visited Goshen? The last time I was in Goshen was when my sister Polly died. Probably about five years ago? Ten years ago? Well, at least 10 or 12 years ago…it’s been a while. I’m old, old, old. What has been one of your most valuable life experiences? Raising children and seeing how they turn out. What is the most noticeable difference between kids when you were growing up and kids today? Children didn’t have as much distractions in my day as they do now. So Rose, what do you want to be remembered for? I’d like to be remembered for being a good Christian because I love my God. I like the Christian way of life. I’d like to be remembered for raising a good family, and just showing people the way to heaven. If you could do it all over again, is there anything that you would do differently? No I don’t think…except I probably would have had things run a little bit smoother. One more question, Rose…Do you still remember the alma mater? To our motto, we’ll be true! Goshen College, I love you! I remember that! I remember a lot of things. A wonderful interview with a lovely woman. I’m so thankful to hear about her and also from her. Thank you.